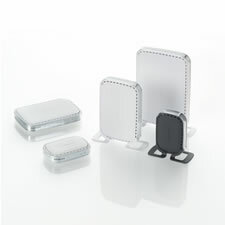 For its Platinum II line of networking products, Netgear wanted an enclosure design that would visually unite the line and be scalable to various-sized future offerings. Each device (currently three with more in the works) shares the same design language, allowing Netgear to introduce new products quickly. The enclosures feature the same cross-section, ventilation detail and feet as well as the same user-interface: a printed Mylar label set behind a clear lens and illuminated from behind by an LED. The Platinum II has won many design awards for its innovative alternative to the bland beige box standard of most computer equipment. Manufacturing and assembly were also streamlined, reducing the average cost of an enclosure by 30 to 40 percent.